H.R.H. the Prince of Wales in front of Sir John Rose’s house, Sherbourne Street, 1860. From WikiMedia Commons. On the evening of Friday, September 7, 1860, Albert Edward, the eighteen-year-old Prince of Wales and son of Queen Victoria, disembarked from a steamer to begin his visit to Toronto. On a two-month tour through British North America and into the United States—the first official royal visit—the heir apparent to the throne was greeted by a cheering throng of fifty thousand. Across British North America, civic officials went to great lengths to stage spectacles, balls, and entertainments in the prince’s honour, and to present their community’s unity and devout loyalty to the crown. With reporters from the continent’s leading newspapers tagging along, the 1860 visit, Ian Radforth writes in Royal Spectacle: The 1860 Visit of the Prince of Wales to Canada and the United States, was a major event and a media sensation. But, as Radforth notes, for all the pomp and circumstance (and controversy), “the visit passed from public memory long ago and even in histories of the period it gets scarcely a mention.” The prince’s visit to Toronto provided both a sensational short-term media splash and a long-standing but little known royal tradition—one which will be continued this weekend when Queen Elizabeth II and Prince Philip arrive in Toronto as part of their 22nd official royal visit to our country. 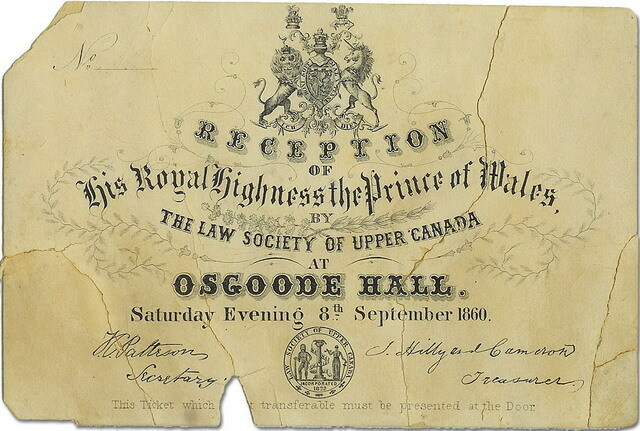 Invitation to the Prince of Wales Ball, 1860, from the The Law Society of Upper Canada Archives, 995.022. From “Osgoode Hall Turns 175,” an online exhibit at the Archives of Ontario. 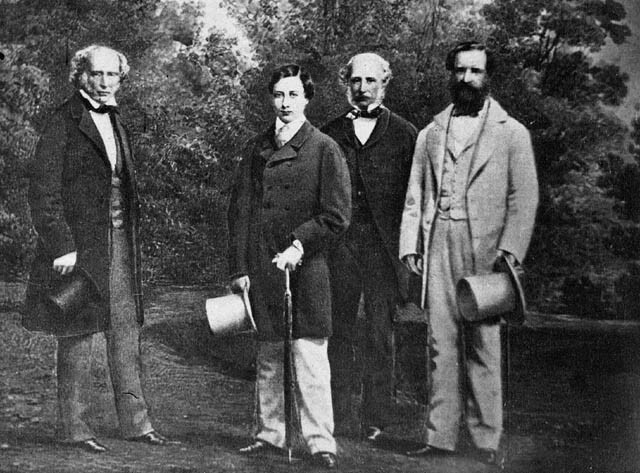 The Prince of Wales and entourage arrived in British North America in late August of 1860. His travels through Newfoundland, the Maritime provinces, and Canada East (as it was then known) were covered in great detail in newspapers. Toronto’s boosters wanted to produce a better display for the prince than anywhere else. Preparations included erecting fixtures for gas-fueled illuminations on City Hall at a cost of $250, constructing a special amphitheatre on the waterfront to host the celebrations upon his arrival, and planning the route of the prince’s procession through the colonial city. The Law Society of Upper Canada spent $1,100 to decoratively illuminate Osgoode Hall, where they planned to host a ball for the prince. Across Canada, communities had erected ceremonial arches—some modest, some elaborate—in the prince’s honour. Usually these were merely a few poles, dressed in evergreen boughs and flowers, and draped in flags, regal symbols, and mottoes like “Rule Britannia.” Others, designed by leading architects and decorated by well-known artists, could include illumination by gas fixtures. There were several major arches in Toronto. One, on John Street near the wharf where the prince was to land, was decorated lavishly with “lotus leaves tastefully gilt,” as one newspaper put it. The Harvest Arch at King and York, designed by Sandford Fleming was, Radforth notes, “a complex structure made up of sixteen small arches and two large ones, with an immense crown on top.” The most controversial, however, was the Orangemen‘s arch at King and Church streets, near St. James’ Cathedral, where the prince would attend Sunday service during his visit. The Orange effort consisted of a central arch, with a watchtower rising sixty feet, and smaller arches over the surrounding sidewalks. Albert Edward, the Prince of Wales, 1860. From Robert Cellem, Visit of His Royal Highness The Prince of Wales (Henry Rowsell, 1861). The prominent roles given to francophones and representatives of the Catholic church in Canada East proved objectionable to many anglophones in the predominantly Protestant Canada West. Their attitude was exacerbated by the existing political debates in the Province of Canada, where francophones were thought to be over-represented in the legislature and had been consistently strengthening their basic rights, such as the right to denominational education [pdf]. And so, with no fewer than twenty lodges in Toronto, the Orange Order—the Protestant fraternal organization—naturally wanted to enjoy a prominent role in the official reception in response. The Duke of Newcastle, however, had gotten wind of Orange Order ambitions in Canada West even before formal protests from local Irish Catholics in Kingston and Toronto—who refused to participate in any official procession requiring them to march beneath Orange symbols—reached him. The Colonial Secretary (instructed by the queen to act as the youthful prince’s trusted advisor on the trip) objected to any Orange displays, however well-meaning. At that very moment in England, Parliament was passing measures to suppress the display of Orange flags and party emblems in Ireland as a result of conflicts that summer in Ulster. 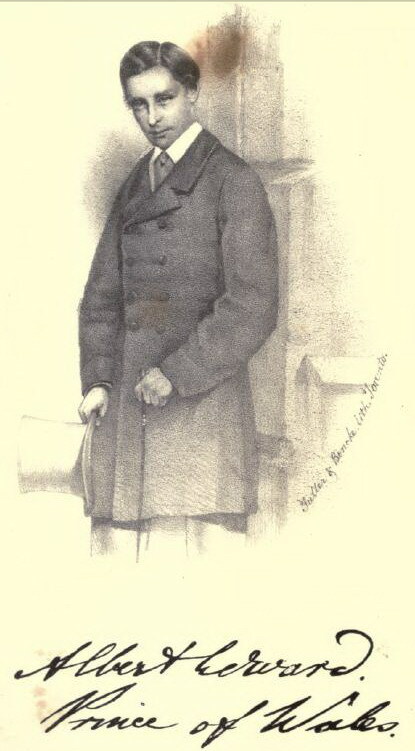 Through correspondence from Governor General Sir Edmund Walker Head, Newcastle made his intention to shield the prince from any possible scene of religious feud or breach of the peace clear to Canada West civic officials. The Prince of Wales, he promised, would walk under no Orange arch, Radforth notes, “nor would he visit any town where Orangemen persisted in demonstrating in their regalia.” Mere days later, Kingston Orangemen defiantly showed up at the wharf in full fraternal colours to greet the prince’s arrival. And, true to the duke’s word, the prince’s steamer never landed, despite local attempts to negotiate a compromise. 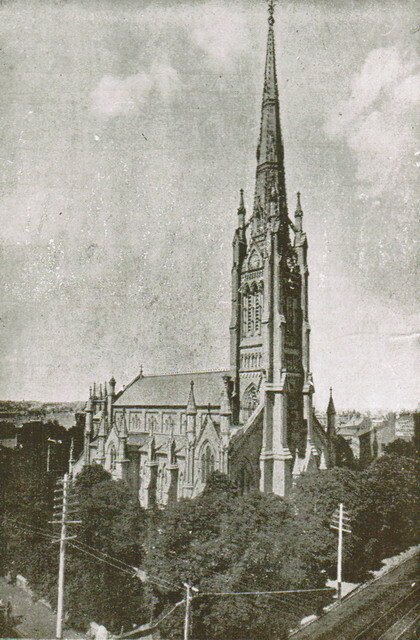 Image of St. James’ Cathedral which, minus the electric wires, was much as it looked in 1860. From A Guide to the Cathedral Church of St. James (1932). Toronto civic officials initially panicked, but were able to reach a compromise with the leadership of the local lodges. The Orange arch was stripped of all symbols and the Orangemen marched, in their full regalia of bright yellow and orange robes, carrying silk banners, in the hours prior to the prince’s arrival on September 7. Then they changed clothes and attended the official ceremonies as private citizens. A signature page from the bible donated to St. James’ Cathedral by the Prince of Wales in 1860, courtesy of Nancy Mallett at the St. James’ Cathedral Archives. The interior of the church was jammed because, although admission was by numbered ticket, no one had kept order. The prince and entourage entered at exactly eleven o’clock, received by churchwardens, the cathedral clergymen, the archdeacons of York and Kingston, and the bishop. As Edward walked up the aisle, the congregation stood and the organ played a fervent welcome. Once settled, the service began with Rev. H.J. Grassett and others from the archdiocese, reading prayers, lessons, the epistle, the gospel, and the offertory. As the bishop began his sermon—based on the first verse of Psalm 72 (“Give the king thy judgments, O God, and thy righteousness to the king’s son”)—the congregation would’ve been able to hear the gathering commotion outside. The Orangemen among the streetside crowd, outraged that the prince’s carriage had taken a detour along Queen Street to avoid passing under even their unadorned arch, had rushed to local lodges to gather their colours, banners, and regalia to redecorate the arch. Once the prince left the church, a swarm of Orangemen tried to force his carriage beneath the arch by seizing the horses. In a valiant effort—as the newspapers would sensationalize the situation—the carriage driver fought them off and sped the carriage back to Government House. The prince did not reappear that day. After a day trip to the north, he departed for Niagara and the United States. Although the newspapers concentrated on short-term sensationalism of the events outside the cathedral, the Prince of Wales also bequeathed a longer-term legacy to St. James’ Cathedral when he donated a bible. By signing one of the pages, he initiated a royal tradition, just as his royal tour set the pattern of official and public engagements and military reviews followed by each royal visit afterward. When King George VI and Elizabeth attended St. James’ on May 22, 1939, during the first visit to Canada of a reigning monarch, they signed the bible. 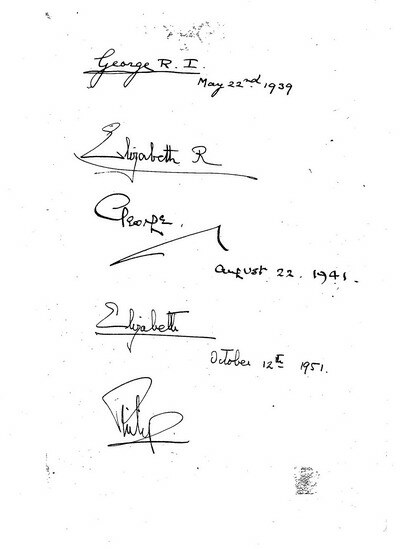 Elizabeth II and Prince Philip signed on the first of several occasions on October 12, 1951. When Charles and Diana signed on October 27, 1991, so too did their young sons, William and Harry. Since Edward, signatures have been thus recorded from every royal—and some other important dignitaries like governors general or Archbishop Desmond Tutu—visiting St. James’ Cathedral. And when she attends the service there tomorrow, Elizabeth II will sign it once again.